Most investors were quick to turn down a tech startup based in Kenya, a country where 42% of the population lives below the poverty line and the largest industries are agriculture and forestry. However, that didn’t deter Leila Janah from launching Samasource, the first non-profit to develop technology training tools and jobs for low-income residents. In order to impact source jobs, that is, deliberately give work to people in need, Samasource secures large contracts from enterprises like Walmart and Google. The company then breaks down these large-scale digital projects into what they call “microwork,” small tasks their workers are trained to complete. Samasource currently employs more than 600 employees across India, Kenya, Uganda, and Haiti. For most, it’s their first formal job. 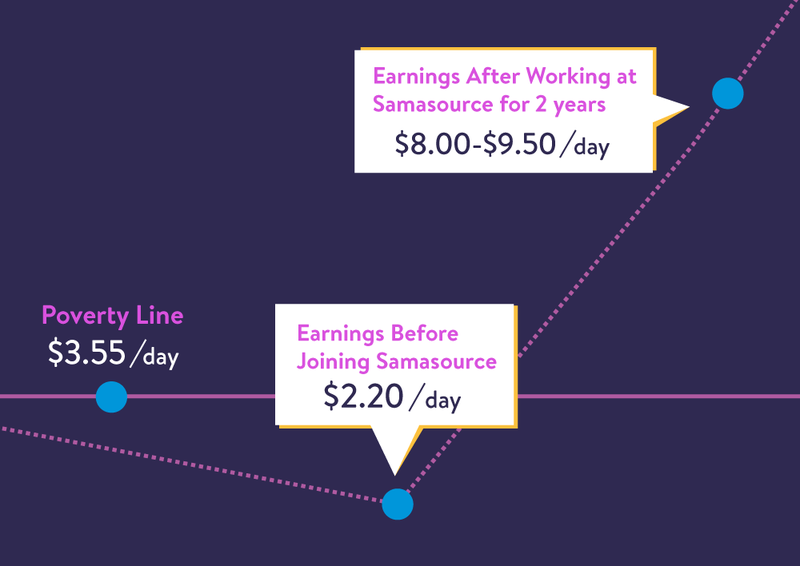 Prior to joining Samasource, people earn around $2.20/day in areas where the poverty line is at $3.55/day. Workers receive training from Samaschool, then become employed by Samasource where they are able to earn a living wage, develop skills, and build their resume. Leila Janah’s goal of increasing the quality of life in poverty-stricken areas creates an intersection between capitalism and non-profit work which is best exemplified in the experience of its employees. In an effort to contribute to positive change, Walmart has been working with Samasource for the past two years. And the partnership isn’t simply based on charity; Samasource teams produce high-quality work that helps further Walmart’s machine learning initiatives. Walmart’s partnership with Samasource includes evaluating Walmart data to ensure accuracy, and training Walmart systems. When an item can’t be classified by the current model, for example, when a completely new product is introduced like the fidget spinner, Walmart needs Samasource to classify the items manually. Additionally, that data is then picked up by the Walmart model, which learns from the manual classification and can begin classifying on its own. Since working together, Samasource has covered more than 2.5 million items, and their work has improved Walmart’s item coverage from 91% to 98%. Even more impressive, Samasource appears to have overcome a common problem in Silicon Valley: over half of the workforce is made up of women. With a lactation room, 90 days of maternity leave, and flexible shifts, Samasource is an example to be followed around the globe. Samasource acknowledges its opportunities for growth and is committed to making necessary changes that will fulfill its initial goal — creating a company that transforms lives, and entire communities, starting with the most in need.